Competitions of the second day of 2010 WTF European Taekwondo Championships taking place in St.Petersburg have come to an end. Gold medals in male division go to Konstantinos Konstantinidis (Germany, under 63g) and Servet Tazegul (Turkey, under 68kg). Gold medalists among women are Floriane Liborio (France under 53kg) and Bat El Gatterer (Israel, under 57 kg). The performance of an athlete from St.Petersburg Vasily Nikitin caused a great interest. It was the first time he has reached semi-finals of such prestigious competitions. Vasily is a graduate of Lesgaft Physical Culture University, a champion of Russia, a Germany Open medalist, and a Universiade medalist. Now his collection of medals is enriched with a European championship bronze. 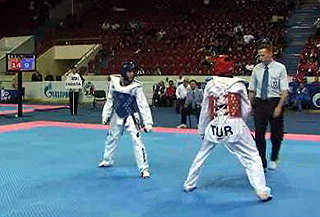 In semi-finals he was edged out by a strong contender, the holder of European Champion title, Servet Tazegul, from Turkey. Servet owns bronze medals from the 2008 Olimpics, 2009 World Championships and many others. Russian team featured another dramatic fight with Dmitry Frank (weight under 63 kg) who failed to get to the semi-finals. Electronic body protectors caused a big number of breaks during his fight, thus affecting the result of Dmitry Frank’s performance. Israel team grabbed their first gold medal at these Championships. Bat El Gatterer got on the top of the victory podium. Coupled with their yesterday bronze, this gold medal will give an impulse to the development of taekwondo in Israel, the heads of Israel team said. On 14th, May, competitions among men in weight division under 74kg and under 80kg and competitions among women in weight division under 62kg and under 67kg will be held. A two-time Champion of Europe Ekaterina Zenkina, a holder of a silver medal from the World Championships Alan Akoev, Avet Osmanov and Kristina Khafizova will represent Russia.